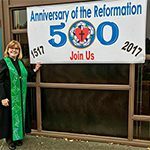 Prior to becoming an ordained minister, I worked as a parish nurse, counselor, and volunteer in churches developing faith and health ministries. For 32 years before and after seminary I worked as a psychiatric nurse therapist and a forensic nurse specializing in helping trauma victims. Now as a science and theology doctoral-prepared minister, my ability to provide a more holistic ministry to my congregation and community is greatly enhanced. In 2013 I became the first woman to graduate from Pittsburgh Theological Seminary’s Doctor of Ministry Science and Theology Focus. 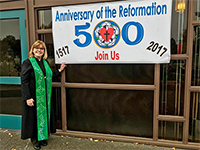 I came to the program with a bachelor of science degree from the University of Iowa, a master of science degree from the University of California, San Francisco, and a master of divinity degree from Princeton Theological Seminary. When I began my search in 2010, Pittsburgh Seminary’s D.Min. Program in Science and Theology was the first and only one I could find at a Presbyterian seminary in the U.S. 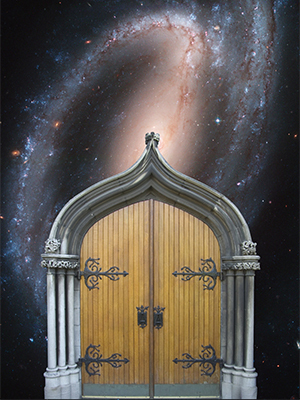 I wanted to combine my past science background with a doctorate in ministry. So I was elated to find Pittsburgh Theological Seminary had developed a brand new program combining the two areas—science and theology. In my D.Min. project, titled The Effect of Prayer on Resiliency, I compared three groups who prayed daily in three different ways for six weeks and measured each person’s resilience status before and after the six week period of time. Using a resilience survey developed by healthcare professionals, the group using the contemplative form of prayer showed a significant improvement in their resilience status. The group using a prayer bead form of praying also saw an enhancement of their resilience. The group that continued to pray spontaneously (as per their usual routine) showed a static resilience status with no enhancement. Because of these finding, I now am more intentional about promoting contemplative prayer in my ministry. Now as a science and theology doctoral-prepared minister, my ability to provide a more holistic ministry to my congregation and community is greatly enhanced. The congregation I currently serve appreciates how I combine science with theology in my sermons because I address both their physical and spiritual health needs. The research findings by Dr. Harold Koenig at Duke University (and many others who research spirituality and health connections) show the important affect spiritual faith practices can have on physical/mental health status. I believe it is vital for all pastors to become knowledgeable and provide this information to their congregations to promote wholeness in body, mind, and spiritual health. I am eternally grateful for the opportunity to combine my extensive background in healthcare with a doctorate in science and theology. The Seminary’s next Science and Theology D.Min. cohort meets in June 2018. Learn more about the program, and plan to join us!